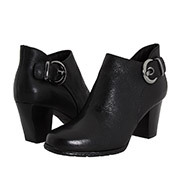 If I was in the market for a refined bootie with buckles and hardwear, this would be it. Buttery soft leather, tapered fit on the ankle, and super comfy. Stunning quality. Also available in chocolate brown. As I write these boots are on sale for $282.75. 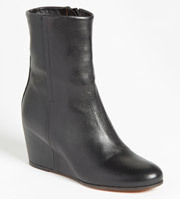 I have happy clients in these ankle boots with covered wedge heel. Comfortable, streamlined, and therefore ideal to wear with skirts and dresses. Dress them up or down, and be sure to read the rave reviews. Also available in a smoke suede version. As I write these boots are on sale for $296.98. 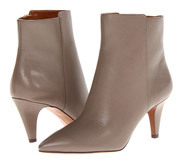 This is a simple dressy ankle boot with a three inch heel and sleek ankle fit. Its pointy toe shape isn’t too long, stubby or severe. I found it quite comfortable, but the heel is above my comfortable height. It runs small so size up at least half or a full size. Apart from black, taupe and animal print, it’s also available in chocolate brown, which is an elusive shoe colour these days. I would not recommend this bootie for wider feet. Wear it with bootcut trousers, tapered trousers and jeans, cropped pants, boyfriend jeans, baggy shorts, skirts and dresses. 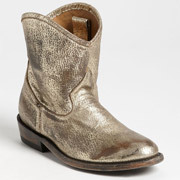 A casual metallic boot is hard to find, and this one fits the bill. Not overly pointy, but not all that round either. Appropriately distressed for team “rough around the edges” who have the magpie gene. A nice update for Autumn and Winter Mums and gals on the go. Fab cushioning footbed and runs true to size. I vote pewter or gold, but it also comes in black and tan. I love this distressed little ankle boot. Its Western vibe and the unique metallic colour, somewhere in between silver and gold, make for a fun contrast. Looks great under bootcut and straight-legged pants, but you can also tuck in your skinnies or slouchier jeans and trousers for a very on trend look. 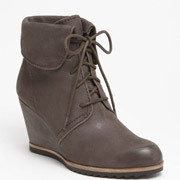 This fab casual lace-up bootie is soft and cushioning. I highly recommend it if 3 1/4″ wedges are a comfortable height for you. You can fold up the ankle flaps to create a longer boot. It reminds me of a dressier version of a high-top sneaker, and can be worn in the same way. Available in grey and black. Be sure to read the rave reviews. 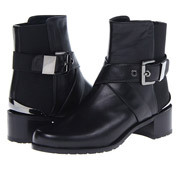 The metallic detailing on these sleek pull-on ankle boots is a subtle nod to this year’s sci-fi trend. 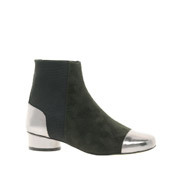 I like the graphic integrity of the silver colour-blocking, the low circular heel, and the close fit on the ankle. I have not tried these on in person but have a hunch they will be comfortable because of the elastic inserts and suede-esque upper. Great to add a fun edge to a jeans, shorts or trouser outfit. 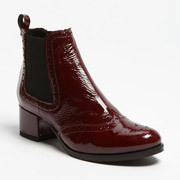 This slip-on ankle boot is KILLER! It perfectly combines the very on-trend androgynous vibe with ladylike detailing. The patent crinkle polish adds great textural interest, and with a 1 3/4″ heel it’s very comfortable as well. This cutie is made in Italy and runs true to size, but it will probably not fit a wider foot. It comes in black and burgundy, the colour of the season. Beautiful! 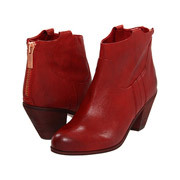 This beautiful ankle boot has a stacked low-ish heel that is stable, and a quite comfortable footbed. It comes in five colours but the red gets my top vote because dark red is the colour of the season. The rose gold zipper is a nice finishing touch. They might run half a size big. 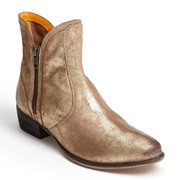 These are Frye look-alikes at half the price. This is a well made shoe with tidy stitching and solid hardware. Its minimalistic look and neat ankle fit makes it ideal for skirts and dresses as well as trousers and jeans. Runs true to size, and is very comfortable. A good city walking shoe if you’re good in a two inch heel.